We all get headaches from time to time. Sometimes they are self-induced through stress, diet or lack of movement and other times they signal that something else is might be going on inside our bodies. 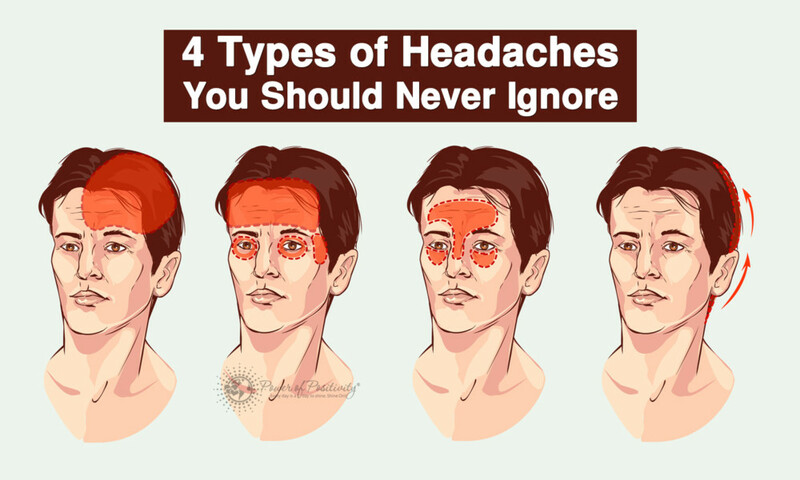 It’s important to know that not all headaches are created equal. Listening to our bodies and understanding our headaches, including their triggers, can help us treat them more efficiently. More importantly it can signal us that something more serious is going on and prompt us to seek medical attention. Please know the information in this article is for education purposes only and is not meant to diagnose or to be used as a course of treatment without medical guidance. It is always advisable to see your doctor when you experience any symptoms that are unusual, unexplainable, or persistent. Tension headaches are the most common type of headache. It’s reported that 90% of people will experience one in their lifetime. They are the result of tightness, or tension, in the muscles of the upper back and neck usually caused by stress and fatigue. The pain is mild to moderate and manifests itself through a dull pressure or tightness in the forehead. You can treat these headaches through natural relaxation methods like yoga, meditation, massage or even nap. If they persist, over the counter pain relievers are also an option. Sinus headaches happen as a result of an acute sinus infection. The symptoms of a sinus headache are pain around the nose and eyes, a runny nose and fever. The pain can range from mild to severe, and the best treatment is over the counter pain relievers and sinus medications. Many people with migraines might not even be aware that they have one because less severe migraine headaches are often mistaken for a tension or a sinus headache. A migraine is a neurological condition that results in throbbing pain, sensitivity to light and sound, nausea and vomiting. Certain triggers such as a sensitivity to climate changes, hormonal imbalances, reactions to certain foods, and visual disturbances may help predict oncoming migraine pain that ranges from moderate to severe. People suffering from chronic migraines are usually under a doctor’s care, which includes a remedy along with lifestyle changes. Cluster headaches are rare, affecting only .1% of the population. They tend to occur at the same time every day, so doctors believe the hypothalamus is involved as it’s responsible for controlling our body’s clock. They are called cluster headaches because they come in clusters daily over several weeks. It begins with excruciating pain behind the eye and usually begins shortly after sleep. Cluster headaches are triggered by alcohol and are also more common in smokers. Treatment for cluster headaches are treated through your wellness professional and can include medications, nerve blocks and even melatonin. There has been a lot of discussion in the news lately regarding concussion and sport, specifically within the NFL. It’s hard to avoid headaches in many contact sports including hockey, boxing, football, and rugby. The pain and symptoms are varied, so it’s important to seek a proper diagnosis if you are experiencing frequent headaches following exercise or playing a sport. Thunderclap headaches are named for their sudden, explosive pain. These severe headaches peak within 60 seconds, but the pain can linger for more than a week. It’s important to pay attention to the warning sign of a thunderclap headache because it usually a sign of more serious illness. It is extremely important to seek medical help right away when experiencing one. When seeing a doctor for a thunderclap or any a headache, prepare by bringing as much information about the episodes as possible. Note the symptoms, triggers, any medications, and write down questions for the doctor. The more information we have, the better equipped our doctor is to formulate a course of action. Headaches are a warning sign, and they are trying to tell us something. Whether they are saying slow down and relax or alerting us to a more serious condition, it will do us good to pay attention to what they are saying and seek professional help when they are severe and persistent.